Snickers Knee Pads – Snickers offer a range of Knee Pads designed to fit comfortably inside Snickers Trousers. So lightweight and comfortable you will forget they are there. These are a far better option then external knee pads that can pinch the backs of your legs when kneeling causing even more serious issues. The ultimate in comfort, cushioning and protection for your knees. Advanced and ventilating kneepads in high-tech D3O Lite™ material. 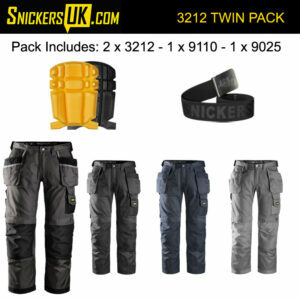 Ready for the Snickers Workwear KneeGuard™ positioning system. EN 14404 (Type 2, Level 1). The floorlayer’s certified knee protection. Kneepads that maintain their shape, hold their position – and won’t slide around when you’re hard at work. EN 14404 (Type 2, Level 1). The ultimate floorlayer kneepads. Advanced 3D design and high-tech D3O® Lite material ensure long-lasting certified protection, comfort and cushioning when working on your knees. EN 14404 (Type 2, Level 1).